Chamber Music Unbound is a nonprofit 501(c)3 arts organization dedicated to providing outstanding classical music performances and music education to the growing populations of Mono and Inyo counties. 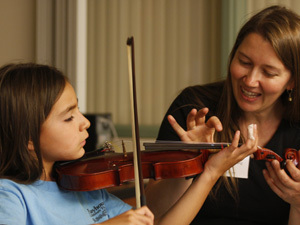 CMU offers a variety of activities for children and adults which nurture the love for music in people of all ages and backgrounds. CMU continues the programs that originated in 1998 as part of the Felici Trio's Rural Residency, a grant program of the National Endowment for the Arts (NEA). Youth programs include in-school assemblies and classroom encounters for all grade levels, as well as after-school instrumental classes. Adult education and outreach is conducted in close collaboration with other institutions such as Cerro Coso Community College. CELEBRATING 20 YEARS IN THE EASTERN SIERRA! In the early fall of 1998 a young group of musicians moved from Milan, Italy, to Mammoth Lakes, CA. They had been awarded the prestigious Rural Residencies Grant from the National Endowment for the Arts in order to bring Classical chamber music to underserved communities; they were the Felici Piano Trio. Twenty years later, the trio has become part of the cultural landscape of the Eastern Sierra. Mountains and music go together like horse (or mule?) and carriage, and some of the most beloved compositions in the repertoire were inspired by the natural beauty of mountain-scapes like ours. In the intimacy of small venues, the hearts of attentive audiences and the hands of high-powered performers, great music continues to thrive. Thank you for your interest and support, and please join us to celebrate and hear The Next Generation of musicians alongside the Felici Piano Trio! To download the winter season brochure, click here. ©2018 The Felici Piano Trio. All Rights Reserved.